Dr. Wooten is internationally recognized for his contributions to the field of Parkinson’s disease treatment and research. 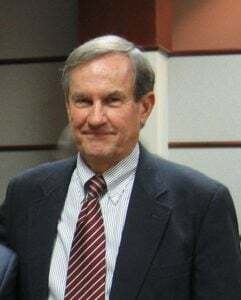 The former chairman of the University of Virginia’s (UVA) Department of Neurology, he received his BA from Rice University, MD from Cornell University Medical College and studied on the post graduate level at Cornell, the University of California Hospital in San Francisco, and the National Institutes of Mental Health. He has earned more than 50 honors, awards and grants, delivered more than 100 invited lectures, and published more than 200 publications, book chapters, and review articles. Dr. Wooten has a longtime relationship with APDA beginning in 1979 when he received the first APDA George A. Cotzias, MD, Fellowship. Subsequently he served as chairman of the Scientific Advisory Board for 15 years, director of APDA’s Center for Advanced Research, and medical director of APDA’s Information & Referral Center, both at UVA. He serves on medical advisory committees and editorial boards for numerous U.S. and international Parkinson’s disease and neurological organizations and publications.